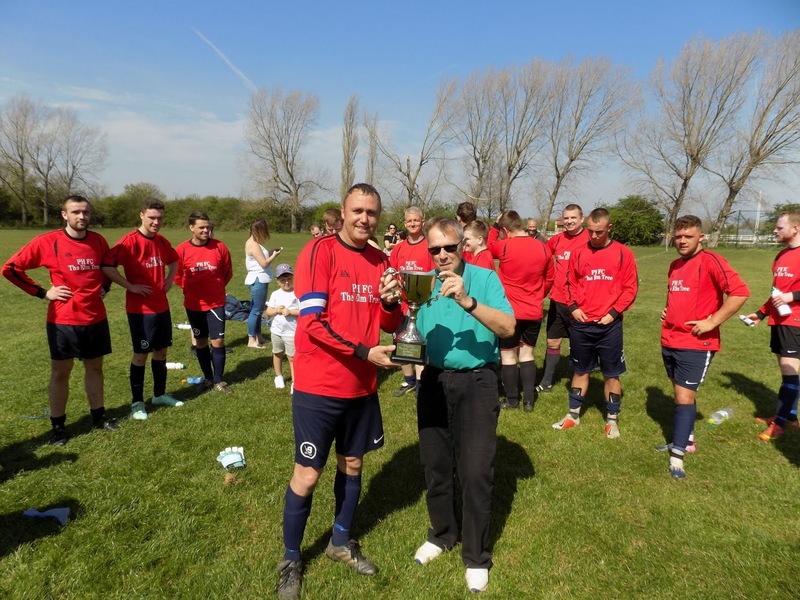 PH Elmtree secured the first division title with a 2-1 win over their nearest rivals Stockton Sun Inn on a hot spring morning at Grangefield. It took just 51 seconds for PH Elmtree to open the scoring when a long throw was hurled into the penalty area and it was knocked done and Callum Westwood was on hand to fire home. The same player had an excellent chance to double the lead on five minutes but fired wide. The game became a midfield battle as neither side really created anything before the break. In the 50th minute Stockton Sun Inn had a right wing corner which was well collected by Elmtree keeper Darren White who then launched the ball up field and this found Chris Stockton who latched onto the ball and drilled it home under the keeper for 2-0. In the 71st minute Stockton Sun Inn were awarded a corner on the right, this was launched into the box and Charlie Inman outjumped everyone to head home for Sun Inn and set up a finale. 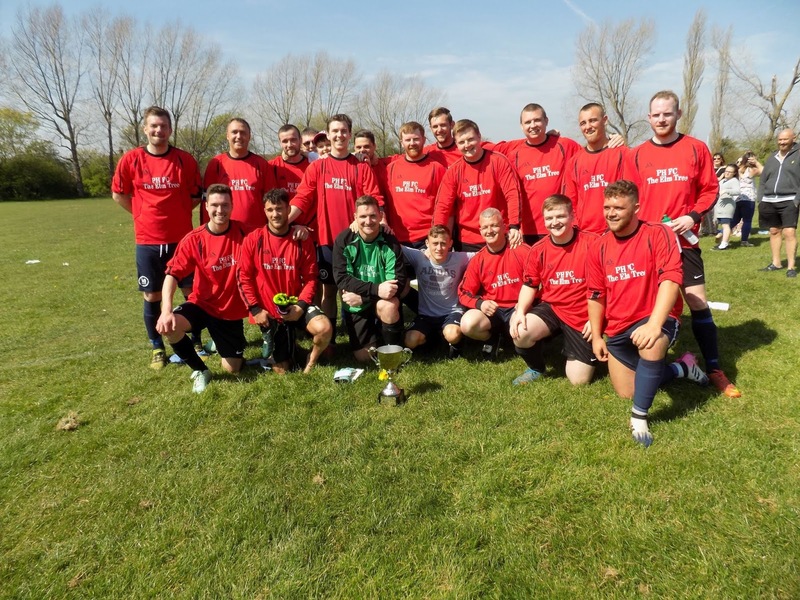 However PH Elmtree kept Stockton Sun Inn at bay and ran out 2-1 winners to clinch the title. League Secretary Ken Clark presented the Division One trophy to PH Elmtree captain Danny Lawson. The two sides will meet again this Sunday in the final of the Steven Wells Memorial Trophy at Thornaby F.C kick off 10-30am. Admission is £3 or £1 concessions. The PH Elmtree squad following their division one title win. Meanwhile in Division One Horse & Jockey entertained Stillington The Royal but slipped to a 5-2 defeat, scorers for Stillington The Royal were Billy Gatenby (2), Mark Ferguson, Aaron Rumble and substitute Andrew Blackburn and for Horse & Jockey the goals came from Chris Johnson and Daniel Horsley. 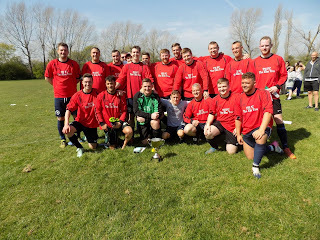 In Division Two Borowalkers were crowned champions following a 7-0 win against their closest rivals thanks to two goals each from Isam Benomran and Carl Robinson plus a goal each from Mason McNeil, Joe Forster and Elliot May. The Borowalkers squad and management following their league title at the weekend. Last weekend saw Yarm Albion entertain Yarm Athletic in a local derby with a lot riding on the game, more so for Yarm Albion who are chasing Borowalkers at the top of the table. It started badly for the home side when the visitors took the lead on 5 minutes when a right wing free kick to the far post was drilled home by David Higgins however Yarm Albion got back into the game with three quick goals, the first after 13 minutes when a cross from the right found Tom Atkinson who fired home and three minutes later the same player drilled a free kick home from 20 yards and then on 19 minutes Liam Southall scored from the edge of the area. The game settles as both teams played some good football but it was Yarm Albion who extended their lead on 22 minutes when a shot from outside the box was parried by the Yarm Athletic keeper only for Luke Smithyman to follow up and tap home goal number four and that was how it remained up to half-time. The second saw Yarm Athletic come more into the game as they gradually clawed their way back into the match, first Josh Larkin headed home a left wing cross on 53 minutes and then on 77 minutes he headed home a right wing cross to make the score 4-3. However Yarm Albion hit straight back when Tom Atkinson outstripped the Yarm Athletic defence and slotted home number five and completed his hat-trick on 78 minutes. Yarm Athletic scored again in the 89th minute when Matthew Crofts scored form 20 yards to set up a frantic finish. An excellent game well played by both teams and well refereed by James Bancroft who was assisted by Matty Carroll and Steve Urwin, well done to all concerned. Elsewhere in Division Two Borowalkers were 7-1 winners away to Marton Rovers to maintain their lead at the top of the table thanks to a hat-trick from Isam Benomran plus a goal each from Elliot May, Joe Forster, Lewis Robertson and Connor Johnson. In the semi-final of the Ian Gorman Memorial Trophy Billingham The Merlin entertained premiership champions Portrack and were rewarded with a 4-1 victory thanks to a hat-trick from Mikey McGee and one goal from Jake Stott and for Portrack their goal was scored by substitute James Dawson. Billingham The Merlin will now meet Stockton Sun Inn in the final at Thornaby on the 12 May 2019. In Division One PH Elmtree strengthened their grip at the top of the table following a 3-0 home win against Stillington The Royal with goals from John James, Ian Durant and Rory Sawyer meanwhile rivals Stockton Sun Inn could only draw with RSD leaving PH Elmtree needing a point to win the league. RSD started strongly and built up a two goal lead thanks to Wayne Flanagan but Stockton Sun Inn hit back to level the scores through Carl Stonehouse and Charlie Inman. Horse & Jockey continued their recent good form with a 5-1 win at home to St Marys 1947 Sunday thanks to two goals from Daniel Horsley and one each for Andrew Armstrong, Matthew Snowdon and substitute Kye Hutchinson whilst Chris Taylor replied for St Marys 1947 Sunday. The Premier Division concluded last Sunday with Portrack already crowned champions hosted Norton Village Club and slipped to a 5-2 defeat; this win for Norton Village Club was well deserved. There was a hat-trick from Ryan Watson and one goal for Matthew Watson plus an own goal from Portrack skipper Danny Dawson. Goals for the Portrack came from a Gareth Poole second half penalty and Ricky Dull added a second late in the game. Meanwhile Billingham The Merlin secured runners-up spot with a 5-1 win away to Thornaby Oddfellows thanks to a hat-trick from Mark Dixon and a goal each from Stewart Bath and Mark Lilley, Charlie Raby scored the only goal for Thornaby Oddfellows. In Division Two Yarm Albion moved level on points with Borowalkers but have played a game more following a 3-0 home win against Marton Rovers. Goals from Ashley Trodden, Conna Merryweather and Bradley Heads set up the victory. Borowalkers were 3-0 winners at home to Riverside thanks to a hat-trick from Isan Benomran. Middlesbrough Rovers entertained Parkwood but slipped to a narrow 2-1 defeat, Parkwood’s goals coming from Sean Fowler and Mark Blowes. In Division One St Marys 1947 Sunday hosted RSD and the teams shared five goals but it was the visitors who shaded the tie thanks to goals from Liam Davis, Wayne Flanagan and Andrew Morgan, for St Marys 1947 Sunday the goals came from Christopher Waites and Joshua O’Donoghue. Elsewhere Stillington The Royal defeated Thornaby Roundel 5-0 thanks to two goals from Billy Gatenby plus one each from Mark Ferguson, Marlon Balechi and substitute Aaron Sinclair. The first semi-final of the Ian Gorman Memorial Trophy took place at Tilery last Sunday between first division sides PH Elmtree and Stockton Sun Inn in a game played under windy conditions. Stockton Sun Inn had the benefit of the wind in the first half and took the lead through Charlie Inman, PH Elmtree hit back and were awarded a penalty when Steven Roberts was brought down but the resulting kick was high and wide. Stockton Sun Inn made the most of the wind and added a second before half time from James Ward. PH Elmtree enjoyed the benefit of the wind behind them and dominated the second half eventually pulling a goal back from substitute Ian Evans, this gave PH Elmtree the incentive to push on which they did but could not find a way through the Sun Inn defence for the equaliser. About ten minutes from time Sun Inn had a rare foray into the Elmtree half and were rewarded with a third goal from Daniel McLay, PH Elmtree were not to be outdone and went up the other end and John James scored to set up a frantic finale but it was too little too late as time ran out and Stockton Sun Inn booked their place in the Ian Gorman Memorial Trophy final, opponents as yet unknown. In the quarter final premiership Billingham The Merlin entertained first division Horse & Jockey and they ran out comfortable 8-0 winners. There was a hat-trick from Jake Stott, two goals from Nathan Bayes and one from James McLeod and one each from substitutes Bradley Popple and Elliot Pledger. Meanwhile in the other outstanding quarter final tie Stillington The Royal entertained premiership champions Portrack but it was the visitors who came out on top winning 5-0 thanks to two goals each from Jonathan McLone and Ricky Dull plus one from Gareth Poole, this sets up a semi-final tie between Billingham The Merlin and Portrack for a place in the final. In the Division Two cup semi-final Yarm Albion entertained the leaders Borowalkers at Conyers School and it was the visitors who booked a place in the final with a narrow 2-1 victory thanks to goals from Carl Robinson and Elliot May whilst for Yarm Albion the goal came from Thomas Atkinson. In the Premier Division there was only one fixture as Thornaby Oddfellows entertained Norton Village Club and the teams shared eight goals but Norton Village Club scored five to set up the win. Norton Village Club goals came from Glenn Corkain and Ryan Watson both scoring twice and one for Aidan Cattermole whilst for Thornaby Oddfellows the goals came from Benjamin Kerry, Charlie Raby and Joe Carter. 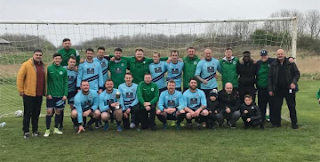 In Division One Village Park Rangers completed their season with a 2-0 home win against Billingham Cowpen Club thanks to goals from Karl Charlton and Gavin Robson. Karl Charlton ended the season with 49 goals in league and cup fixtures, he also recorded 10 man of the match awards. In Division Two there was only one fixture when Thornaby Park entertained Yarm Athletic in a preview of their forthcoming semi-final tie this time Thornaby Park edged the game 1-0 thanks to the only goal of the game from Leon Roddam. Due to heavy rain Friday and Saturday only two fixtures were possible last weekend both in division two, in the first Thornaby Sports & Leisure and Eaglescliffe switched their game from Harold Wilson to Acklam Green Centre all weather pitch. Eaglescliffe started the better of the two sides and took the lead through Ryan Blight who latched onto a through ball and calmly slotted home. Eaglescliffe increased their lead through man of the match Adam Thompson when he headed home, the seemed to have settled but were pegged back when Thornaby Sports & Leisure scored to make it 2-1 however a free kick from outside the box from Matthew Purcell sailed over the Thornaby Sports & Leisure wall and into the top corner leaving the keeper helpless. In the other Yarm Albion agreed to switch their league game with The Queen Vic to Tilery but the weather struck and the game was switched to the 3G at North Shore where Yarm Albion ran out comfortable 7-1 winners thanks to four goals from Thomas Atkinson and a hat-trick from James Plumb with Lee Tait scoring for The Queen Vic. This latest win leaves Yarm Albion three points behind the leaders Borowalkers with four games remaining and still have play each other again in the league and cup. The Premiership title was settled on Sunday when Billingham The Merlin entertained Portrack at Bede College and it was the visitors who triumphed 2-1 to lift the title. A penalty in the first half from Gareth Poole and a second in the second half from Jake Large saw the Portrack home. However a late goal from James McLeod set up a nervy finish but Portrack remained strong and resolute and saw the game out. In the Ian Gorman Memorial Trophy quarter final tie premiership Norton George & Dragon entertained first division leaders PH Elmtree and suffered a massive 6-0 defeat thanks to a hat-trick from Chris Stockton and two goals from Callum Westwood plus one from Steven Roberts. PH Elmtree will now meet first division rivals Stockton Sun Inn in the semi-final. In Division One Village Park Rangers entertained Stillington The Royal and the teams shared nine goals and it was the visitors who edged the game by the odd goal. Scorers for Village Park Rangers were Karl Charlton (2) and Gavin Robson and Russell Cowan whilst Marlon Baleci scored twice for Stillington The Royal plus goals from Mark Ferguson, Billy Gatenby and Chris Upton. Meanwhile RSD and Horse & Jockey shared six goals and the points when they met at Tilery, RSD goals saw Liam Davis score twice with one for Wayne Flanagan and for Horse & Jockey the goals came from Andrew Armstrong, Christopher Lambert and Matthew Snowdon. Stockton Sun Inn entertained Thornaby Roundel and ran out 8-3 winners with a hat-trick from Carl Stonehouse, two goals from Jamie Roberts and one each from Sam Higgins, Jordan Auckland and substitute Luke Croft meanwhile for Thornaby Roundel Mark Graham, Peter Oldfield and Daniel Longley were the goal scorers. In Division Two leaders Borowalkers were away to bottom of the table The George Pub & Grill who could only muster 10 players and it showed as Borowalkers ran out 13-1 winners with their goals coming from Carl Robinson (4), Lewis Robertson (2) plus a goal each from Isam Benomran. Elliot May plus substitutes Liam McCarten, Mason McNeil, Nic Rodgers and Shaun Smith with Anthony Carter scoring for The George Pub & Grill. Parkwood entertained Eaglescliffe at Yarm Road and won by the odd goal in three with goals from Sean Fowler and Daniel Calvert whilst Tommy Leech scored for Eaglescliffe. Thornaby Sports & Leisure edged Thornaby Park by the odd goal in seven in a local derby as they ran out 4-3 winners at Harold Wilson. Goals from David Stewart (2), Andrew Bollands and substitute Matthew May set up the victory whilst Luke Conn, Christopher Fairless and Dominic Halliday replied for Thornaby Park. Stockton Sun Inn closed the gap on leaders PH Elmtree who were on cup duty with an emphatic 8-2 win away to St Marys 1947 Sunday thanks to four goals from Jamie Roberts plus two goals for Carl Stonehouse and one each from Charlie Inman and Steven Carberry. For St Marys 1947 Sunday the goals came from Christopher Waites and an own goal. Horse & Jockey entertained Billingham Cowpen Club and the sides shared six goals and the points in a three all draw, Horse & Jockey’s goals came from Andrew Armstrong, Lee Jordan and Daniel Horley whilst Martin Fields scored all three for Billingham Cowpen Club. In Division Two Middlesbrough Rovers were away to Thornaby Sports & Leisure and came away with a 4-0 victory thanks to goals from Adam Quinn and Robert Keenan plus two from substitute Louis Johnson. Eaglescliffe entertained Yarm Albion but slipped to a narrow 3-1 defeat that would have been more if not for man of the match Eaglescliffe keeper Adam Thompson. Goals from Bradley Heads and two from substitute James Plumb set up the victory, Ben Hurst scored for Eaglescliffe. Yarm Athletic was at home to Parkwood and edged the game by the odd goal in three thanks to goals from Joshua Larkin and Matthew Jones whilst Jason Earl was on target for Parkwood. In the Steven Wells Memorial Trophy semi-final PH Elmtree progressed to the final with a convincing 8-0 win away at Thornaby Roundel. There was a hat-trick from Joseph Thompson, two goals from substitute John James plus a goal each from Rory Sawyer, Ian Evans and substitute Callum Westwood. 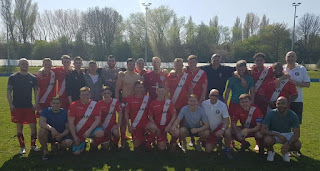 This win earned PH Elmtree a place in the final against Stockton Sun Inn to be played at Thornaby FC on 28 April 2019. In the Premier division Norton George & Dragon completed their league season with a 4-1 win away to Thornaby Oddfellows thanks to goals from Christopher Atkinson, Phil Horsman, Paul Cleary and Mitchell Howes and for Thornaby Oddfellows Anton Buchan was the scorer. The only other fixture saw JFC United entertain Norton Unicorn as both also completed the league season and finished with a 2-2 draw. Goals for JFC United came from Famara Jatta and Trevor Zziwa and for Norton Unicorn Lewis Powell scored both the goals. In the North Riding Sunday Challenge Cup semi-final the league’s last representative Borowalkers suffered a 5-4 defeat on penalties after a 2-2 draw with Cowtons. Goal scorers for Borowalkers were Lewis Robertson and Joe Forster. In Division One the leaders PH Elmtree enjoyed a 3-0 win away to a depleted Horse & Jockey who only had 11 players. Horse & Jockey defended well as PH Elmtree strived for the opening goal which eventually came from Rory Sawyer in the first half. The second half saw Horse & Jockey again battling throughout created a couple of chances but eventually goals from Ian Evans and substitute John James sealed the victory. Elsewhere The Griffin entertained Stillington The Royal and both teams had to settle for a share of the points in a 2-2 draw, Kieron Wilson and Jordan Wallace scoring for The Griffin and Billy Gatenby scoring both goals for Stillington The Royal. Billingham The Kings entertained St Marys 1947 Sunday at High Grange and it was the visitors who came out on top winning 5-1 thanks to two goals from Chris Taylor plus a goal each for Liam Bendelow, Stephen Dean and Christopher Waites whilst James O’Brien scored for Billingham The Kings. Billingham Cowpen Club entertained RSD at Rievaulx Avenue and it was the visitors who came out on top winning 4-2 thanks to a hat-trick from Wayne Flanagan and one goal for Liam Davis, Martin Fields scored both the goals for Billingham Cowpen Club. In the Premier Division leaders Portrack were 6-2 winners against Thornaby Oddfellows thanks to two goals from Ricky Dull plus two for substitute Joseph Hillerby and one each from Gareth Poole and Jamie Dawson. For Thornaby Oddfellows the goals came from Bradley Murray and Charlie Raby. Billingham The Merlin kept up the pressure at the top of the table with a 3-0 win against Norton George & Dragon thanks to two goals from Jake Stott and one for Stewart Bath. Norton Village Club entertained JFC United at North Shore Academy and ran out 5-1 winners with a hat-trick from Jamie Barton and a goal each from Danny Lambert and Scott Hine whilst Dimitri Aime Kehi replied for JFC United. The Dubliners were at home to Norton Unicorn and ran out 6-1 winners thanks to a hat-trick from John Brown, two goals from Charlie Iveson and one from Rory McCabe whilst Lewis Powell was on target for Norton Unicorn. In Division Two leaders Borowalkers were away to Thornaby Park and ran out 6-2 winners thanks to goals from Isam Benomran, Elliot Graham, Reece Breslin, Robert O’Connor, Carl Robinson and Lewis Robertson, for Thornaby Park Jarred Winner and Leon Roddam were the scorers. Second placed Yarm Albion were 4-2 winners at home to Middlesbrough Rovers with a hat-trick for Hal Jenkins and one goal from Liam Southall and for Middlesbrough Rovers Adam Quinn and Daniel O’Brien were the scorers. Eaglescliffe edged a tight game against third placed Riverside coming out on top with the only goal of the game from Martin White. Thornaby Sports & Leisure were 3-1 winners against Parkwood at Harold Wilson thanks to two goals from Michael Tye and one from Jack Walton and for Parkwood their goal was scored by Scott Wright. In the Steven Wells Memorial Trophy Semi-Final Stockton Sun Inn booked a place in the final with a 4-2 win at home to Village Park Rangers, Jamie Roberts scored a hat-trick for Sun Inn plus one goal from Carl Stonehouse and for Village Park Rangers Karl Charlton and Liam Blyth were the scorers. Stockton Sun Inn will now meet either Thornaby Roundel or PH Elmtree who play this coming weekend for a place in the final on the 28 April. In the Premiership Norton Village Club entertained Norton George & Dragon at North Shore Academy and ran out comfortable winners 5-1. The first 25 minutes was fairly even until Norton Village Club took the lead on 27 minutes when a free kick was latched onto by Nathan Watson who fired home. The George then had a period of pressure and created three good opportunities however there was some full bloodied defending from the home side and all efforts were blocked. The George were made to pay on 33 minutes as a defender lost the ball on the half way line to Matthew Watson and he drove forward into the penalty area and drilled the ball home hard and low. Norton Village Club extended their lead right on half time when a Ryan Watson free kick from the half way line was headed back to his keeper by Phil Horsman but the keeper had come for the ball and the ball ended up in the net for 3-0. The second half saw Norton George & Dragon try and pull the game around but were caught out once again on 67thminute when a George corner was cleared and a long cross field ball out of defence found Danny Lambert in acres of space and he honed in on goal and drilled the ball home. Danny Lambert added his second and Norton Village Club’s fifth on 80 minutes when he fired home. Norton George & Dragon eventually scored what was a consolation goal on 82 minutes when Nathan Mohun scored at the second attempt after the keeper saved his first effort. Elsewhere Billingham The Merlin were away to South Bank and ran out comfortable 8-1 thanks to goals from Jae Morgan, Jake Stott and James McLeod plus a hat-trick from substitute Mikey McGee and also a goal each from substitutes Elliot Pledger and Bradley Popple. The Dubliners entertained Thornaby Oddfellows at Harold Wilson in a game that produced 12 goals but it was the visitors who came out on top 8-4 thanks to two goals for Arron Brookbanks and a goal each from Benjamin Kerry, Richard Robinson, Bradley Murray, Charlie Raby, Samuel Wilson and substitute Jack Robinson. In Division One the top two sides both won with PH Elmtree recording a 6-0 win at home to Billingham The Kings thanks to two goals each from Callum Westwood and Ian Durant and a goal apiece for Martyn Coles and Mitchell Tucker. Meanwhile Stockton Sun Inn were 5-1 winners at home to Horse & Jockey with two goals from Jamie Roberts and a goal each for James Ward, Daniel McLay and Carl Stonehouse. These two teams are well clear at the top of the table and still have to play each other in what could be a title decider. RSD entertained Village Park Rangers at Tilery and came out on top by the odd goal in five, two goals from Wayne Flanagan and one for Dale Evans set up the win whilst Karl Charlton scored both goals for Village Park Rangers. St Marys 1947 Sunday were 1-0 winners away to The Griffin thanks to the only goal of the game from Michael Butler. Thornaby Roundel switched their game against Stillington The Royal to Stillington and were rewarded with a 4-3 victory to dent Stillington The Royal’s promotion bid. Two goals from Daniel Longley and one each for David Campbell and Joe Canwell and for Stillington The Royal Billy Gatenby scored twice plus one from John Paul Spence. TS1 Tees Valley entertained Billingham Cowpen Club but slipped to defeat going down 8-3, Billingham Cowpen Club scorers were Billy Crookston and Martin Fields with two goals each and goals from Callum Maddren, Ricki Bloomfield, Leighton Harbron and Scott Crookston, for TS1 Tees Valley Basit Ali scored twice plus one from Marc Knowles. In Division Two Borowalkers extended their lead at the top of the table with Yarm Albion not playing with a 5-1 win at home to Parkwood with two goals apiece from Carl Robinson and Isam Benomran and one from Marcellus Kerr whilst Scott Wright replied for Parkwood. Riverside moved into second spot with a 2-0 win against The Queen Vic thanks to two goals from Benjamin Jukic but have played more games that the other teams. Marton Rovers were at home to Thornaby Park and ran out 6-2 winners thanks to five goals from Andrew Townsend and one from Kevin Young for Thornaby Park the goals were scored by Arron Butta and Dominic Halliday. Middlesbrough Rovers edged a tight game by the odd goal in three against Eaglescliffe with both Middlesbrough Rovers goals from Adam Quinn and for Eaglescliffe Martin White was the scorer. Yarm Athletic and The George Pub & Grill shared eight goals and the points when they met at Conyers School, Aaron Naqui, Joshua Larkin, Matthew Crofts and Michael Robinson scored for Yarm Athletic whilst Anthony Hollinshead scored a hat-trick and Trevor Golden once for the The George Pub & Grill. In the semi-final of the North Riding Sunday County Cup Thornaby Oddfellows progressed to the final with a 5-1 home win against Brompton Academy thanks to two goals each from Arron Brookbanks and Anton Buchan plus one from Benjamin Kerry. In the final they will meet Middlesbrough Dormans who edged past JFC United 6-5 on penalties following a 2-2 draw in 90 minutes, JFC United goals came from Junior Masandi and Famara Jatta. In the North Riding Sunday Challenge Cup Borowalkers are the last team left and they progressed to the semi-final following a 6-3 win away to Cleveland United thanks to a hat-trick from Isam Benomran and two goals from Joe Forster plus one for David Gove. In the Premier Division Portrack continue to lead the way following a 5-1 win away to Norton Village Club thanks to goals from Gareth Poole, Harrison Davies, Sam Foxton, Ricky Dull and Sean O’Brien with Matthew Watson scoring for Norton Village Club. Norton George & Dragon kept up their challenge with a 4-1 home win against South Bank thanks to goals from Nathan Mohun, Christopher Burton and two goals from substitute Paul Cleary and Ben Watcham scored the South Bank goal. 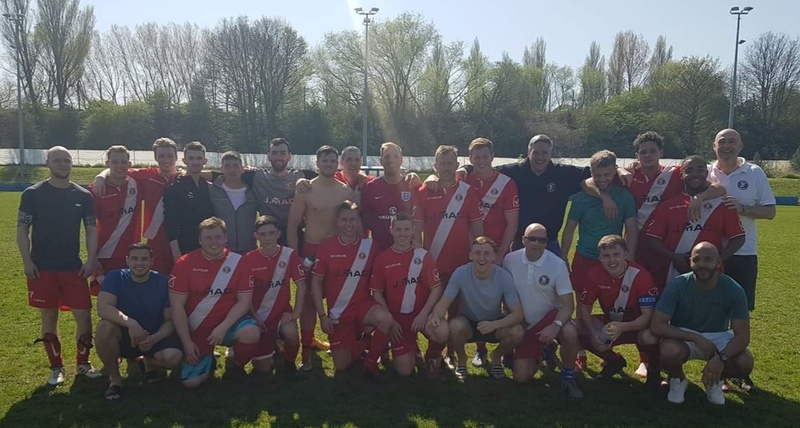 In Division One Stockton Sun Inn had an important win in their quest for promotion with a 3-0 victory over close rivals Stillington The Royal. Daniel McLay scored one plus two goals from substitute Sonni Coleman. PH Elmtree continue to lead the way following a 3-1 win away to RSD with goals from Craig Bishop, Callum Westwood and substitute Lewis Hargreaves and for RSD Kelvin Cardwell was the scorer. The Griffin entertained Village Park Rangers in a local derby and it was the home side who came out on top 4-2 thanks to two goals from Michael McGouran and a goal from Andrew Bashford plus an own goal and for Village Park Rangers Karl Charlton and Robert Edemenson were the scorers. Horse & Jockey were 6-1 winners away to TS1 Tees Valley with two goals from Chris Johnson plus a goal each from Carl Dinsdale, Tom Beattie, Luke Spence and Lee Jordan, for TS1 Tees Valley Ahmed Sherif was the scorer. St Marys 1947 Sunday were 5-1 winners away to Thornaby Roundel thanks to goals from Christopher Waites, Francis Hynes, Michael Butler, Stephen Dean plus an own goal and for Thornaby Roundel Kieran Campbell was the scorer. In Division Two the top two teams were not playing and fourth placed Riverside entertained third placed Yarm Athletic and moved above their opponents following a 3-1 victory with all the goals coming from substitute Benjamin Jukic, Matthew Jones scoring for Yarm Athletic. Eaglescliffe entertained Thornaby Park and ran out narrow winners 2-1 with goals from Andrew Geddes and Jacob Walters whilst Dominic Halliday was the scorer for Thornaby Park. Parkwood were 4-0 winners away to The George Pub & Grill thanks to goals from Daniel Calvert, Daniel Lithgow, Jack Hart and Mark Downing. Thornaby Sports & Leisure were 6-0 winners at home to Marton Rovers thanks to two goals each from Michael Tye and James Armstrong plus one apiece from James Walton and Andrew Bollands. Middlesbrough Rovers were 4-2 winners away to The Queen Vic thanks to two goals from Robert Keenan plus one each for Aiden Chester and Daniel O’Brien, for The Queen Vic the goals came from Mikey Alderson and Robbie Helyer.